ICC Awards 2018: Taking his greatness to an altogether different level, India captain Virat Kohli once again proved why he is cut above the rest in the gentlemen’s game. 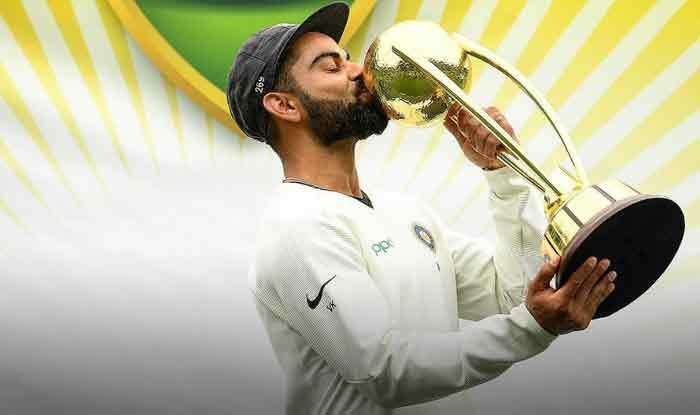 On Tuesday, Kohli becomes the first player in history to win three prestigious ICC awards – the Sir Garfield Sobers Trophy for ICC Cricketer of the Year, the ICC Men’s Test Player of the Year and the ICC ODI Player of the Year awards following his extraordinary outings in 2018. With this honour, the India captain becomes the first player in the history of sport to win all three of top ICC awards. Not only is Kohli the first player to win these three major ICC awards together but he has also been named the captain of the ICC Test and ODI teams of the year for a fabulous run in international cricket. Previously, Kohli had won the ‘Sir Garfield Trophy’ and ‘ICC ODI Player of the Year’ awards last year and was also the ‘ICC ODI Player of the Year’ in 2012. The 30-year old scored 1,322 runs at an average of 55.08 in 13 Tests with five hundreds during the calendar year while in 14 ODIs he amassed 1202 runs at an astonishing average of 133.55 with six centuries. Speaking after receiving the honour, Kohli said: “It feels amazing. It’s a reward for all the hard work that you do throughout the calendar year. I feel really grateful and very, very happy with the team doing well at the same time myself performing. Having recognition at the global level from the ICC is something you feel proud of as a cricketer because you understand that there are many players playing the game. Kohli broke into the limelight when he led India to victory at the ICC U19 Cricket World Cup in Malaysia in 2008. He finished the year as the top-ranked batsman in Tests and ODIs. The highest scorer in both formats of the game in 2018. The dynamic Kohli was one of only two batsmen to score more than 1,000 runs in Tests and only among three to do so in ODI cricket. Kohli was also the unanimous choice of the Voting Academy* for the Sir Garfield Sobers Trophy with South Africa fast bowler Kagiso Rabada coming in second to him for both this award and the ICC Test Player of the Year award. Whereas, Afghanistan leg-spinner Rashid Khan was runner up to Kohli for the ICC ODI Player of the Year award. ICC Chief Executive David Richardson also spoke a few words of praise for Kohli: “Sincere congratulations to every one of our individual winners and those players named in our ICC Test and ODI teams of the year. Special mention must go to Virat Kohli, who becomes the first ever player to win the Sir Garfield Sobers award along with Test Player of the Year and ODI Player of the Year and be named as captain of both teams.